I believe these are our BEST DAYS! Corrie Ten Boom once said, “God doesn’t have problems, He only has plans.” God doesn’t make good or bad days for you. God makes each day to fit perfectly into His plan for you. He made this day so you could glorify Him. He made this day so that He could draw you closer to His heart. He made this day so that you could see your life from His point of view. If you are committed to God’s plan for your life, it means that TODAY IS YOUR DESTINY. Not because you feel like it is, or because you pretend that it is; not because everything is going perfectly, circumstances are ideal, or health or wealth are optimum or all is going your way. It means TODAY IS YOUR BEST DAY because you are where God has placed you for His purpose! And the things that happen to you today will be an unfolding of that purpose. Your old missionary brother is close to his 88th birthday and is still “shouting for the battle” and praising God for the measure of health He is giving that enables me to “keep calm and carry on”! As of this writing we have completed 26 mission trips and 55 trips with the big Dodge diesel and its 15’ van trailer. A total of 122 mission visits were made. God has given us a wonderful team and excellent equipment. We are most thankful to our Heavenly Father for His loving kindness and great faithfulness! A new minister was walking with an older, more seasoned minister in the garden one day. Feeling a bit insecure about what God had for him to do, he was asking the older preacher for some advice. The older preacher walked up to a rosebush, handed the young preacher a rosebud and told him to open it without tearing off any petals. The young preacher looked in disbelief at the older preacher and was trying to figure out what a rosebud could possibly have to do with his wanting to know the will of God for his life and ministry. But because of his great respect for the older preacher, he proceeded to try to unfold the rose, while keeping every petal intact. It wasn’t long before he realized how impossible this was to do. I hope you enjoyed being reminded to let go and let God unfold your life. The “spring has sprung” and summer began an exciting visit to Fort Hall Indian Reservation 750 miles from Portland in southeast Idaho near Pocatello. We praise God and thank our Bro. Marvin Boettcher who carried that burden and put the trip together. We have been challenged by the many doors opening to us under God’s hand and blessing. With our whole crew busy, Marv handled this important visit himself. The big Dodge Diesel and trailer were filled with an interesting load. 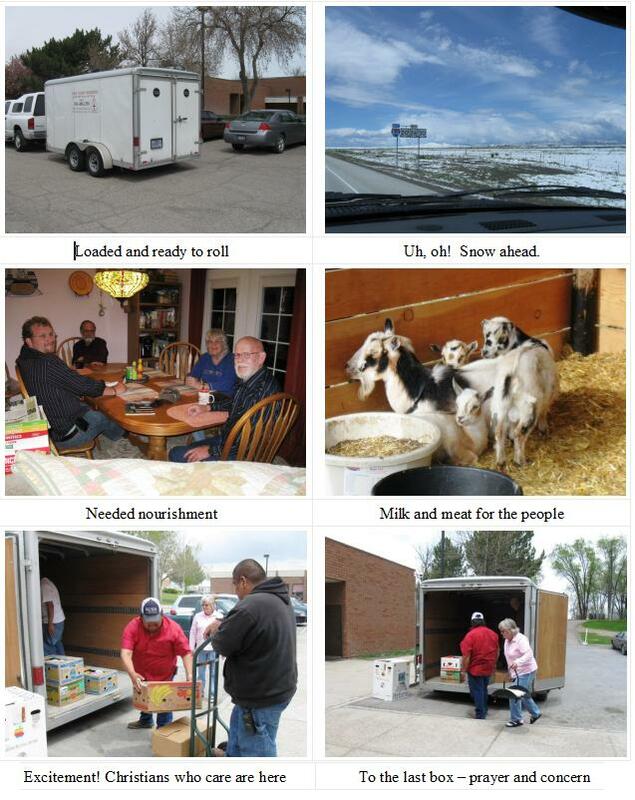 Besides Bibles, food, and clothing, there were goats donated by Marv. What a blessing these little creatures are, providing milk and meat and keeping the grass and weeds, which the goats enjoy, closely trimmed. The commencement week at NIBS is an exciting time of fellowship with staff, students, and fellow missionaries. Your old Bro. Don wasn’t up to the fast pace and heavy load, so Les Phipps took charge with Bob King. Then to our delight, Brent Gjesdal stepped up to help and to see the beautiful memorial building honoring the memory of his aunt, Viola Gjesdal, who for years was on NIBS’s staff. First Nation Ministries had the joy of moving the Deeter family to minister in Alaska and were happy to see they were visiting the school, their Alma Mater. Also, Bro. Bill Edwards, one of God’s most outstanding “old war horse” missionaries, was present. Cecelia spotted bear, whom we help at Wounded Knee, was there to honor her grandson, Alex Bad Bear, and welcome him to pastor at Wounded Knee, South Dakota. After attending Northwest Indian Bible School’s commencement, the team went on to meet Bernie Lovell at the Mission General Store in St. Ignatius. As you can see by their sign, these God-fearing Amish folks aren’t afraid to proclaim their faith to the world. 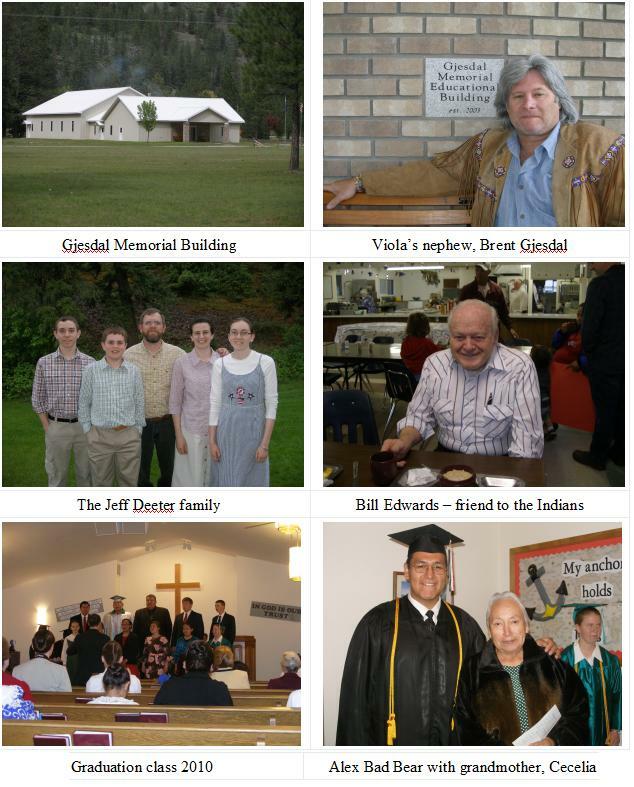 Bernie ministers to St. Ignatius, Elmo, and the surrounding area with food, clothing, and Bibles that we bring to her and by the witness of her life to the love of Jesus for the Native American people. Praise God for people like her who don’t strive for fame or success or wealth, but only to be faithful in their service to the Lord. Marv Boettcher and Mark Hufford traveled to Gallup, New Mexico to deliver food and desk-chairs to Jimmy Bowling and the Wildcat Christian Academy. Jimmy was in Haiti at the time, so Jim Beasly and his sons, Zach and Joey, handled the delivery. A post had to be removed so the Big Rig could get in, but then the food and chairs were gratefully received by the academy and also a Bible school nearby. 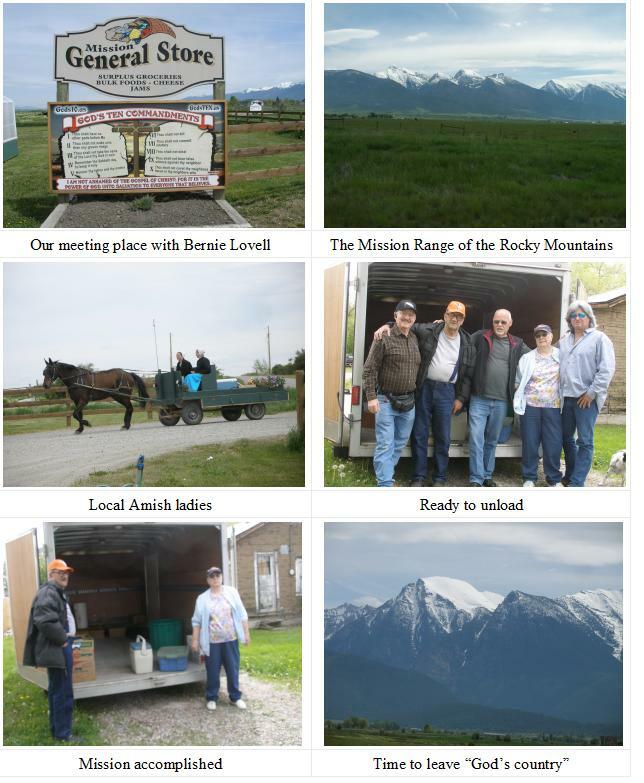 Mark Hufford financed this trip for First Nation Ministries and we can’t thank him enough for it, as the economy has made it hard for many of us. Thank God for the privilege of helping this school that teaches young Indian boys and girls about Jesus!